The Denver & Rio Grande Western Railroad operated in the states of Colorado, Utah, and New Mexico between 1871 and 1988. Begun as a three-foot-gauge line with the intention of linking the cities of Denver and El Paso, it found itself forced by circumstances to change orientation in a westerly direction. The railroad became synonymous with mountain railroading, first with cliffhanging narrow-gauge lines and later with dramatic mainline assaults on the Rockies.The Grande had a chequered corporate history, but finally achieved respectability and profitability during World War 2. It became an important bridge route in the transcontinental system, as well as a feeder system for coal. A crucial aspect of Rio Grande history was its joint receivership with, and eventual merger with, the Denver & Salt Lake Railroad (The “Moffat Road”). 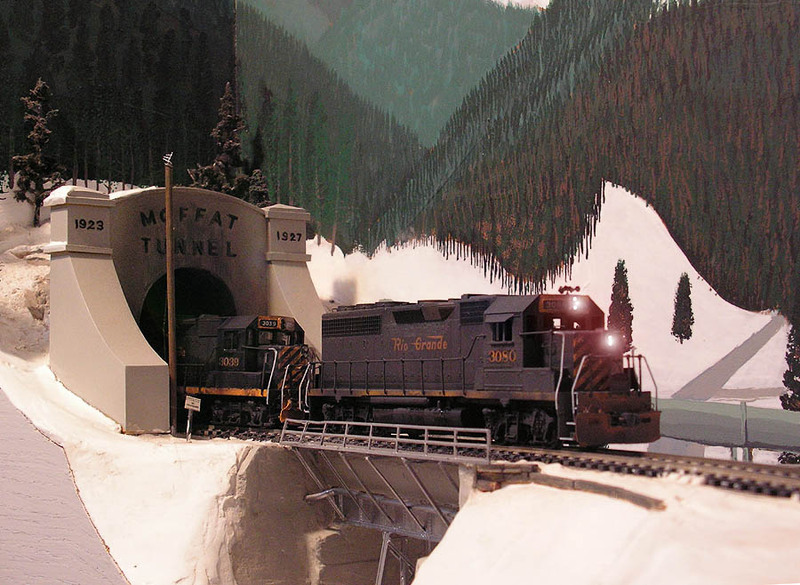 This “short line to nowhere” traveled directly west from Denver, penetrated the Front Range via South Boulder Canyon, and passed under the Continental Divide via the Moffat Tunnel– a 6.2-mile engineering wonder completed in 1927. When a connection was built in 1934 between the D&SL and the Rio Grande’s main line at Dotsero, a direct transcontinental standard-gauge rail line west of Denver became a reality. Facing a changed competitive landscape in the 1980s, Rio Grande’s owners acquired the Southern Pacific Railroad in 1988 and merged the lines– a process that required several years to implement. And just as the system had begun to gel and to turn a profit, the new Southern Pacific Lines was sold to Union Pacific (1996). Now, all Rio Grande lines are part of UP (except for parts that have been spun off to shortline operators). The D&RGW is gone, but certainly not forgotten. Enjoy this tour of the layout, and check back for updates. • I have lost my mind completely– I am currently assembling a fleet of equipment suitable for a 1964 era! F units, high-nose hoods, diesel hydraulics, Alco PA’s, fleets of roofwalk-equipped boxcars, and yet more passenger cars! As soon as the first batch comes through the paint shop, I’ll post some updates here. New Feature: Videos of the railroad in action. I decided that, since Youtube seems to have unlimited file storage space, I’d just upload them there and link them here. I have created my own Youtube channel. Model and prototype videos.